For the Italian Catholic community of Los Angeles, St. Peter’s Church on Broadway has been representing a sanctuary of peace and fraternity for over a hundred years. Thanks to the generous gift of a parish family and to the mastery of Roman artist Enzo Aiello, the community of St. Peter’s could celebrate the installation and blessing on August 9th of a new mosaic, portraying Saint Francis of Assisi and Saint Catherine of Siena, the Patrons of Italy, on the background of the Tuscan and Umbrian hills. Mr. Aiello, how was this mosaic born? At the end of last year, I was contacted by Father Louis Piran, c.s., the Pastor of St. Peter’s Italian Church in Los Angeles. He wanted to commission a mosaic for his Church, portraying St. Catherine and St. Francis. We got along right away, so I started to imagine the two Saints half-length on the backdrop of an Italian landscape. I sent him some sketches and he liked them, so I continued to add more details. In addition to the two Saints, I didn’t want to portray Italian monuments as usual, but rather a rural landscape. We decided to create a landscape similar to the place where St. Francis used to live, drawing inspiration by the hills of Umbria and Tuscany regions that look to me like heaven on earth. How did your interest in this particular art develop? 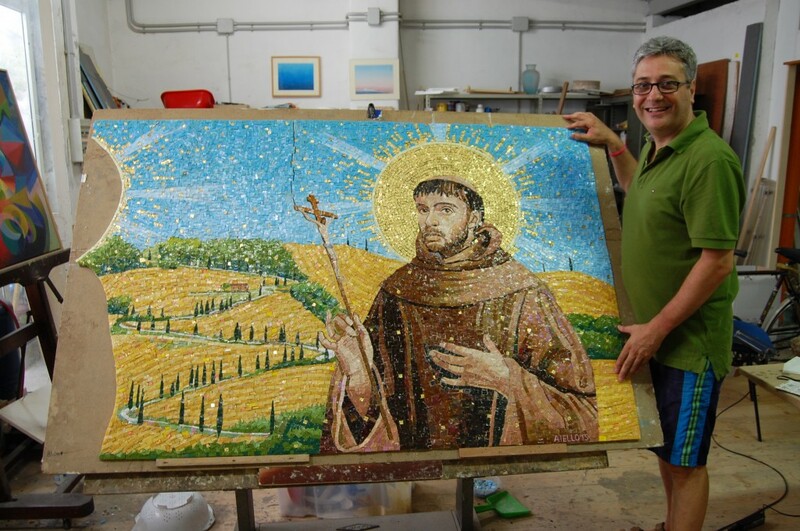 I studied painting at the Fine Art College in Rome and had the fortune to meet a person who, just because of my painting studies, asked me if I wanted to learn the art of mosaic in the Vatican Mosaic Studio in Rome, where at that time they were looking for new apprentices. I remember I was very surprised by this opportunity and in the end accepted it. I started my apprenticeship in this important Studio, established in 1727, when the Pope decided to replace the oil paintings in the Basilica of St. Peter’s that were deteriorating because of humidity with exact mosaic copies. This technique would last forever, and the original paintings could be preserved in the Vatican Museums. After my apprenticeship in Vatican City, where I learnt from old Masters the ancient techniques of Roman mosaic, micro-mosaic and micro-mosaic insmalti filati, I moved to Ravenna for two years to further study the Byzantine technique. Then I returned to Rome, where I specialized in restoring ancient mosaics, dated 2,000 years ago. What does make the ancient art of mosaic still up-to-date? What I like of mosaic is the concept of eternity. A mosaic is an eternal painting, like Domenico Ghirlandaio used to say: “The true painting for the ages is mosaic.” There are mosaics dated more than 2,000 years ago that are still in perfect conditions. Also, the mosaic with its long-lasting quality can be installed outside and thus seen by anybody without being shut in an art gallery. Why did you specialize in religious themes? And what does make your works special? In more than 25 years of career, I have become an artist who works with all mediums: paintings, sculptures, even contemporary art works. I create new mosaics and restore ancient ones. I don’t consider my art special, there are artists around the world much better than me, I just like the idea of bringing a little bit of the Italian beauty to other places in the world. I like that a lot! Even though I grew up in a traditional Catholic family, I am a secular. I had never realized that with my art I would have faced many religious topics. For instance, this year I made a 3D sculpture made in silicon-resin about a biblical theme, neonatal circumcision, a project named HUFO. Three years ago, in Los Angeles, I made “Gethsemanes” another biblical theme, a tridimensional triptych mosaic in polychrome marble that talks about Loneliness, as I have read in Herman Hesse and the Gospel of Matthew. You have been commissioned works all over the world. What is your relationship with the U.S. and L.A. in particular? It is true. I had many commissions from the U.S. I don’t know why, maybe it’s because American people have a great sense of respect, admiration, and devotion toward Italian art. As a matter of fact, UNESCO says that in Italy there is more than 50% of the art heritage of the entire world, and I guess American people know it. As I said before, three years ago in Los Angeles, I made the mosaic “Gethsemanes” for a private client, and last year I was called by the Italian American Museum of Los Angeles to restore a floor mosaic from 1906 at the entrance of the Italian Hall. The Italian Hall is very important for the Italian community in L.A., and it was a great honor and privilege to execute this restoration. Being an artist born in Italy can be a problem: I travel a lot abroad because of my job and I see wonderful places and landscapes, but nowhere else I can find the same combination of art, beauty, elegance, and love for details that distinguishes Italian art, architecture, and landscapes. Father Piran, what does this new mosaic mean to St. Peter’s Church and its community? Italy is popularly described as the land of travelers, poets and saints. What was missing at St. Peter’s was a monument to the glory of St. Francis of Assisi and St. Catherine of Siena, who have been selected to be Patron Saints of Italy for the cultural and religious impact that they had on Italian history. Besides the cultural component of their lives, Saint Francis of Assisi and Saint Catherine of Siena have been and continue to be an important feature of the popular piety of many Italians. Popular piety is not a feature of the Italians only, but a living reality of all the Church. Indeed, popular piety is a true treasure of the People of God. St. Peter’s Church is known throughout the greater Los Angeles for its feasts and processions for their patron saints which have lived a life of heroic virtue, assisted by the Church, during their pilgrimage on earth. Their life’s goal is the same for us: they inspire us to live the life that God wills for each of us today. From now every Italian who will enter their Church of Los Angeles will be “welcomed” at the door by the Saints who are already where we all hope to be one day: with our God.